Sliced white bread with mixed seeds and grains. Medium sliced. Packed with grains and seeds, including sunflower seeds for a rich flavour. Created by our expert bakers. 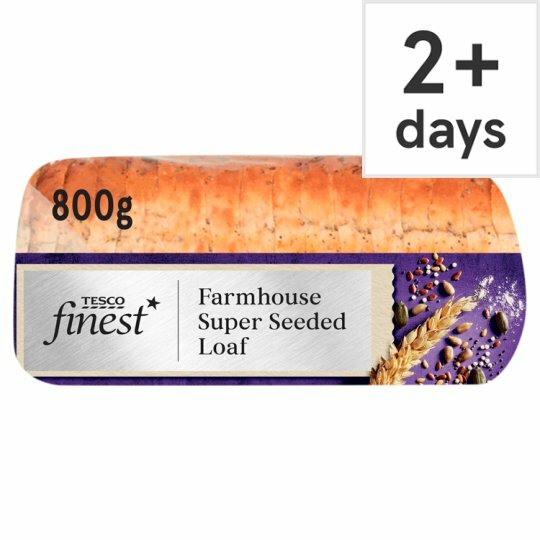 We make this flavour packed loaf using dough blended with seeds and grains, including sunflower and pumpkin, for a rich flavour. It's then rolled in a mixture of five seeds, including poppy seeds, for extra texture. Wheat Flour (Wheat Flour, Calcium Carbonate, Iron, Niacin, Thiamin), Water, Mixed Seeds (16%), Malted Wheat Flakes, Wheat Gluten, Yeast, Salt, Fermented Wheat Flour, Emulsifiers (Mono- and Di-Glycerides of Fatty Acids, Mono- and Di-Acetyl Tartaric Acid Esters of Mono- and Di-Glycerides of Fatty Acids), Rapeseed Oil, Spirit Vinegar, Palm Oil, Flour Treatment Agent (Ascorbic Acid).